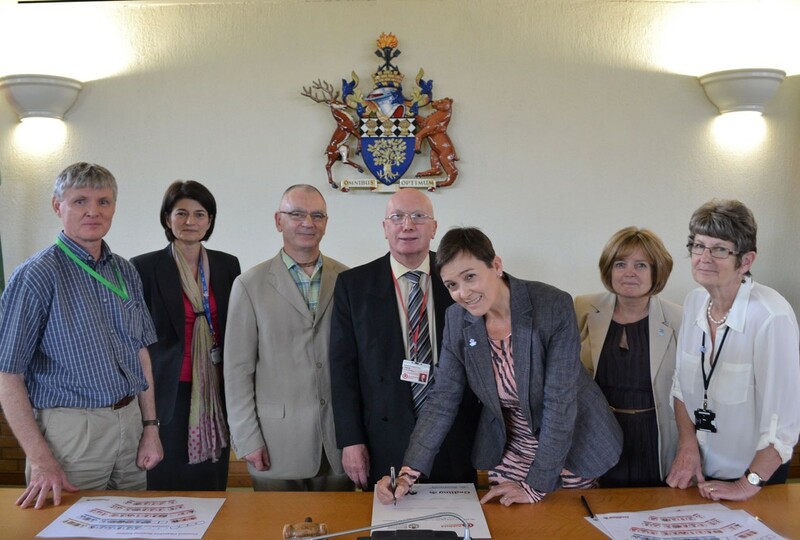 Health and local government leaders from across Nottinghamshire have signed a charter committing to make areas they serve, Dementia Friendly Communities. It follows the The Prime Minister’s challenge on dementia that 20 towns would become Dementia Friendly Communities by 2015. Health officials from NHS Nottingham North and East Clinical Commissioning Group, the organisation that plans and buys health services for Gedling, have joined forces with six other councils including Gedling Borough Council, Ashfield District Council, Broxtowe Borough Council, Newark and Sherwood District Council and Nottinghamshire County Council to make towns and villages in those areas Dementia Friendly Communities. Together, these organisations have pledged to commit to improving services and support for people living with dementia, and their carers. They will now get specific support from leading businesses to help meet the Prime Minister’s Challenge to fight dementia which affects around 800,000 people in the UK. The Alzheimer’s Society predict that the numbers affected will double in the next 40 years. Dementia Friendly Communities will support the five year strategy of the Alzheimer’s Society’s aim to help people living with the condition. • feel confused even when in a familiar environment. There is help available for people with dementia and treatments which can sometimes lessen the symptoms, so it is important you speak to your GP as soon as possible if you are concerned. • The term dementia describes a set of symptoms including memory loss, mood changes, and problems with communicating and reasoning. • Dementia is not part of growing old. It is caused by diseases of the brain, the most common being Alzheimer’s.